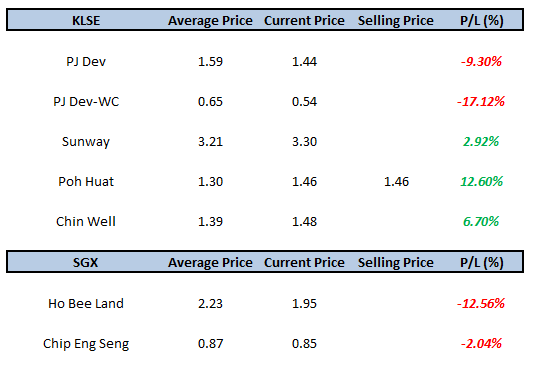 In Dec, I brought in Chin Well into my portfolio on top of PJ Dev and Sunway. Both PJ Dev and Sunway were bought earlier for their corporate actions. Thinking to average down PJ Dev-WC when the price dropped a lot few weeks ago but did not make the move in the end as I don't want to enlarge the portion of warrant in my portfolio. For Singapore, still the same old HB Land and CES. For January, continue to do more studies and will make purchase if their price dropped to my prefer buying price.